Every new year many people make a resolution to learn a foreign language moved by guilt for not succeeding at that in the previous year or just in search for the cure of their hangover (or other more respectable reasons). You, dear reader, may fill in the blanks. 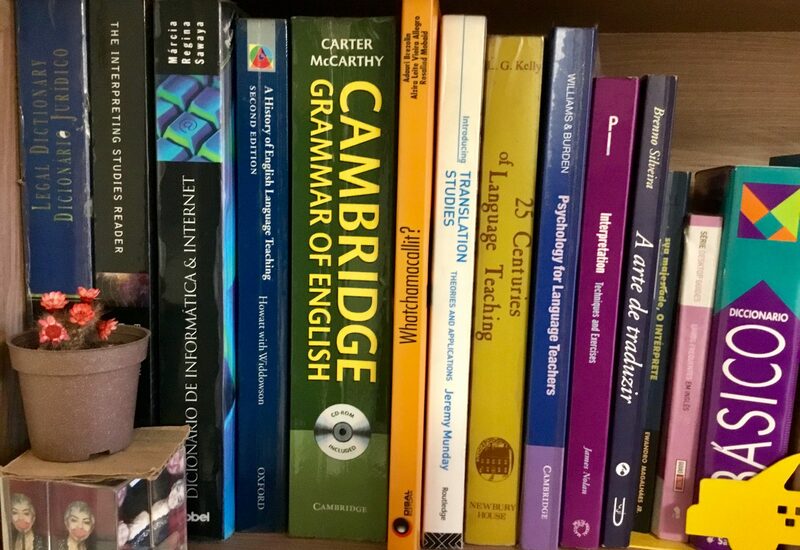 Many go to the language-learning sections at their local bookstore (yes, there are still some of those left around) in search for the book with a mixture of miraculous and magical strategies to enable them to speak English, French, Spanish or Mandarin overnight. By the following week many will realize that no matter how many books and language courses they buy on CD, DVD or online they will sit around gathering dust in a darker corner of their homes and offices before the end of the month. Those failed attempts can be fixed or prevented, though. Surround yourself with LIVING language material: Listening resources play a major part of learning – be they videos, or radio, or podcasts. Even without understanding – it’s passive learning – it will help you identify the “music” of your target language. But it will take time. Let me tell you the example of my “niece-in-law”, Ingrid. As many Brazilians she basically knows the verb to be (present tense) in English. However, after her first child was born 2 months ago she decided that she would help her boy learn English and she would do whatever necessary in the process. I’d advised her to play children’s stories in English for the baby to get familiar with the sounds of the English language and she started listening to them as well. I believe that exclusive audio sources would be better than the TV with so many visual distractions. Conclusion: 2 months later she’s speaking some English with great fluency and her ears have become better trained to identify the sounds and reproduce them. And her 2-month-old baby, João Paulo, is already crying in English – no more “buááá” but “waaaahhhhh” – Just kidding, sort of). Another strong point is that Ingrid is not afraid of trying to speak and now she is moving towards a pre-intermediate level, without having opened a “language course book”. 1. When listening – echo practice – repeat phrases and words you hear, mimic them / parrot them. Be a “fool” on purpose. 2. Establish a regular time to practice – Saturday morning when making coffee and preparing your breakfast, laundry, or whatever. If you have to go shopping make your shopping list in English / play with language / mess around in a creative way. Explore the language. Try to listen to authentic material at least 5 times a week. Other people learn best when they’re reading, but that’s a theme for another blog post. “This year I’ll learn (…. – fill in the blanks)”. But the problem with making resolutions is that they don’t tend to stick. They slip away and melt as if under the tropical sun. Read a book you know well. Preferably a book you liked reading in your mother tongue. When my wife was learning French she bought a copy of the Little Prince (Le Petit Prince) so she could enjoy the book and learn in her new language. Keep a notebook – scribble down new words you learn – especially creating word collocation and usage sections. Revisit the notebook once a week. Use mnemonic devices. It won’t work for everyone but it does work. When learning about the coordinating conjunctions, for instance, you can use the word FANBOYS to help remember the list. Can you name them? I’m pretty sure you can, because of FANBOYS (For, And, Nor, But, Or, Yet, So). That is a mnemonic device. Creating a funny mental picture that you’ll remember is another way to use a mnemonic device. The sillier the picture is, the better it will stick in your head. Listen to podcasts – not only about English learning – but podcasts of other subjects of your interest produced in English or target language. Get a grammar book and do the exercises. Need I say more? Be mindful. Notice language. How it’s used. How it sounds.Create a routine, Stick to it. Read aloud – small texts and paragraphs but that will improve your pronunciation, intonation and fluency. Test yourself – after a month – review the points you’ve learned and test your progress. A few weeks ago I blogged about my favorite podcasts for EFL/ ESL learners (you may check the list here https://americanoidblog.com/2015/12/30/could-you-say-that-again-please-podcasts/ ) and some teachers have been pestering me, I mean, begging me, did I say that aloud?… Some teachers have asked me about podcasts for their “continuing education”. As a self-employed educator and teacher trainer I know the need we all have to recycle, review and learn something useful for the development of our professional careers. When we work for a school or some other sort of organization, there will be times, if we’re lucky, that a course, tutorial, etc will be paid for and we will enjoy the fruits of working for a wise employer. But if you work on your own, any freebie, such as a cool podcast, is really welcome. As far as I know, there are not many podcasts directed to teachers of English as a Foreign or Second Language (EFL / ESL) but still they are in a larger number than those for teachers of other languages. Still looking for a podcast directed to teachers of Spanish (Profesores de Español como Lengua Extranjera o Segunda Lengua). From my experience as a long time podcast listener (since I got my first iPod in 2005) podcasts are catchier, more entertaining and informative when there are 2 or 3 people participating and they don’t go on and on for over 30 minutes (Exceptions may apply when necessary). The podcasts listed here combine knowledge and some informality with some sense of humor and not taking themselves too seriously (with the exception maybe of podcast number 4, which can be quite funny while not trying to be). TEFL Training Institute – http://www.tefltraininginstitute.com/podcast – with great talks and interviews on all TEFL matters ranging from discrimination against teachers, teacher talking time and much more. ELT: WTF – https://elt.wtf – no, no, no cursing allowed, I think. What Tim feels about ELT – as the name implies, Tim presents his insightful observations and ideas from Delta and other teacher certification, backpacking teachers, and much more. Hope these podcasts will help you on this rewarding journey (not financially though) of teaching. If you happen to know of a cool podcast for EFL/ESL teachers please let me know and I’ll be happy to add it to my list above. A year ago I listed some of the podcasts I think students should be using to practice their English and language skills. With the ebb and flow of technology and projects new podcasts have come up with new ideas and new presenters, so here’s an updated list of the podcasts and tested and seen commitment by their producers. 1. 6 Minute English podcast – produced by the BBC with 2 hosts always asking some challenging questions found in the news. It always presents some new vocabulary and context for its use. 2. All Ears English podcast – 2 chicks always teaching some cultural and language point in the English spoken in the US. Beware: one of them slurs and speakstoofastasifshecouldntbotherwhethershesunderstoodornot. 5. English Across the Pond – it’s an interesting approach for language learners – Dan and Jennifer, UK and US residents teaching English as a second or foreign language in a conversational style including cultural and linguistic differences between the 2 Englishes. 6. English Harmony Podcast – prepared by Robby, a non-native English speaker with tips on how to learn English more effectively. 7. English Experts Podcast – Produced by non-native English speakers focuses on the common needs of Brazilian English learners. 8. 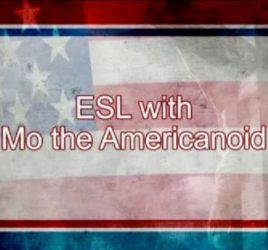 ESL Podcast – The host for the podcast is Dr. Jeff McQuillan, directly from sunny Los Angeles, and he helps read the scripts and provides explanations for them. 10. Inglês Online Podcast – a podcast produced and hosted by Ana Luiza Bergamini, a Brazilian now living in London, with tips of idioms and phrasal verbs for Brazilian English learners – intermediate to advanced. 11. Inglês Todos os Dias – it’s a podcast produced by an American family based in Brazil. Tim and Tammy produce weekly short mini-podcasts with expressions and idioms that his students frequently confuse or ask about. 12. Luke’s English Podcast – produced and hosted by Luke from England – it’s a very good way to expose yourself to British English. But it requires a little patience usually no shorter than 45 minutes. 13. Real Life English Podcast – Founded by three young passionate, world traveling, native speaking English teachers, RealLife is a community based learning portal whose mission is to inspire, empower, and connect the world through English, both online and in-person. Oh Yeah! 14. Richard Vaughan Live podcast – controversial Texas-born Richard Vaughan has painstakingly been trying to teach English to Spaniards. His ramblings are quite entertaining. I love the episodes when he loses his temper with some of his on-air students. dating back to their shortwave transmissions even before the Internet, VOA has been my companion with good quality of listening content on American history, words and news. Happy New Year and Happy Listening.